You can tell that boat show season is around the corner as Jan-Jaap Minnema at Fraser Yachts sends news of a €250,000 price cut on the 37.18m motor yacht Zeepaard, a joint listing with Jeroen Minnema at Ocean Independence. Designed by Vripack and built to Lloyd’s class in 2003 by France’s JFA yard, Zeepaard recently completed a refit including a paint job. 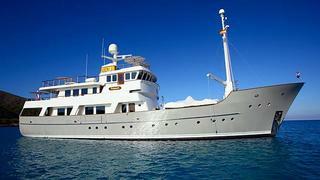 A proven ocean-going vessel, her owner has just finished a three-year cruise around the world on her and is moving on. Zeepaard can accommodate up to 10 guests in five cabins and has been immaculately maintained by professional crew. She comes with very large tenders and lots of toys. Zeepaard will be on display at the Monaco Show and is now asking €11.75 million VAT paid.